← Re-visiting my musical youth. I’ve been Bilton bashed (twice) today as thoughts of Spencer are giving me nightmares. I will get myself in as good a shape as I can for this event. Its going to be huge and such a coup for the Gras, so of course I want to be involved. My only real question is how I wear my hair on the day? I’ve had multiple pieces of advice on this, and I think some discreet fur may be in order for the day. A girl has to have at least a little coverage, don’t you think? Onto other things. The big deal right now is Parade Carnival. 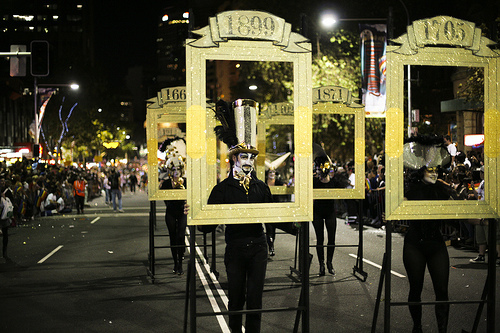 This is a new event for Mardi Gras – something a little different and very exciting for after the parade. I’m really pleased that the organisation is able to do this FREE OF CHARGE for our members, volunteers and parade participants. For those who aren’t any of the above, the cost of entry is very reasonable. The Parade celebrations will continue into the Show Ring, Dome and Forum at the Entertainment Quarter, and the atmosphere will kick on all night. What actually interests me is the opportunity to check out the winning floats up close and personal (will the cute girls be on the floats too?). I’ve always regretted not being able to really appreciate the work and detail that people put into these floats as the parade just goes by so quickly. The other place I will be hanging out on the night is the Dome. It’s not going to be the same as what you expect. Instead it will house one of my fave things: retro and disco. Shall I wear my Choose Life t-shirt? Can’t wait to see you all there boogieing to “the only way is up”… who knows, there may also be a Rick Roll sometime during the night. Tickets available soon, but if you are scared of missing out – sign up for a membership today, and get a free ticket to Carnival. PS: Big Congrats to David Guetta on his Grammy – cant wait to hear you at party! This entry was posted in Lisa, Mardi Gras, Parade. Bookmark the permalink.